The MR3040 is a tiny box having a size similar to an iPhone containing a wifi router, initially to be a 3G bridge, and a 2000mah battery making it an autonomous system. Regarding the photo available on Internet it way not easy for me to get an idea of its size. I hope the following photo will help you. 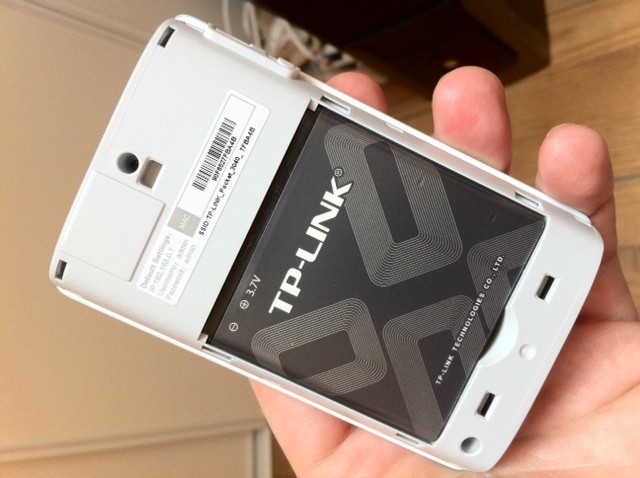 The system has an internal battery looking like a cell-phone battery. This one can be removed but I assume it will not easy to change it later. Sometime I would prefer to have a bigger system with 3 standard LR6 battery … but don’t complain, regarding the price, it is a perfect solution. The battery inside the MR-3040 looks like the photo on the right, the battery is removable and can be refill by connecting the adapter to the usb power plug. The MR3040 also provides an USB master connector where we will connect a USB stick for storage. The Ethernet port will be used for configuration. For the USB stick, I recommend to find a small component in term of physical size but as large as possible in term of storage. Change it after installation is possible but not totally easy so use the good one first it the best. Personally I installed the piratebox on a 32GB measuring about 1cm². I paid 34€ for it. The USB Stick must be FAT32 formated and clean before proceeding. Download the OpenWRT firmware you will found here ; you can also check for the latest version directly on the OpenWRT related page here. Verify you can communicate with the device, normally assigned to 192.168.0.1 by using the following command : “ping 192.168.0.1”. You should get no error. Click on System Tools menu then select firmware upgrade sub-menu. The screen on the right will appear. Click on browse file button to select the firmware file previously downloaded. This upgrade will take about 3-5 minutes then, then web interface will disappear. Change the password, type “passwd” command ; this will activate ssh server. Edit file /etc/config/network using the vi command. A tutorial can be found here. The file should look like this when your Internet Gateway is 10.0.0.254 like me. Otherwise you must adapt. option gateway is the IP address of your Internet router (it should be the same gateway as your laptop) ; list dns is the DNS Ip address, the same your laptop have. Connect to the PirateBox using the “PirateBox – Share Freely” Wifi network ! This entry was posted in Networks, Systems and tagged mr3040, piratebox, tl-mr3040, tutorial. Bookmark the permalink. I think you are doing some useless steps in your howto. 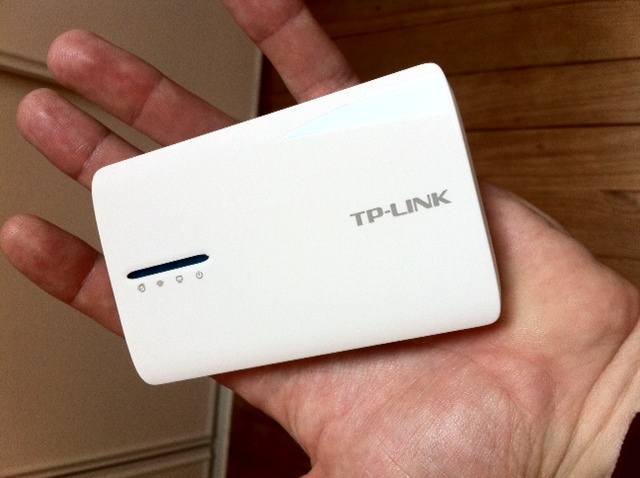 Enabling wifi should be done by the install of the piratebox-package. Do you want to contact me for optimizing and talking about your howto? Thanks a lot for this easy to follow tutorial. Less than an hour after opening the box it was up and running (kingston 16gb in a 5mm format). – From the ipad I’ve not yet managed to send anything yet but live streaming is working perfectly. thank you, it was ok for me. Great, but the download website for the firmware ist down! Do you have any idea where i can download the firmware for the mr3040? Can you mount the USB drives to different systems later? Are they mini boot loaders? or mini kernerls or just “FS”? If just FS, can multiples be used for seperate use? They are just FS you can copy the image files on it on another stick and use this copy to boot your piratebox. I have the las version on MR3040 V2 it have a new firmware 3.14, and i think openwrt is not supported yet ,,, it is correct ? I have done all the process for installation and even installed Kahera image board, but missed to do the final step ” Change admin password” …. – what is the use of the Kahera image board ?!? – now when trying to “Change admin password” and use “vi /opt/piratebox/www/board/config.pl” …. there is no “config.pl” available … only “kahera.pl” …. what is the use of “System config” ? where can I now change the pwds ? how to use them next ? It seems that aod-rpg.de is no longer hosting this. Does anybody else know a source where I get get an updated copy of the ipk?